As pharmacologists we are constantly looking for new therapeutic options for different clinical indications. Some recent examples are mentioned below. 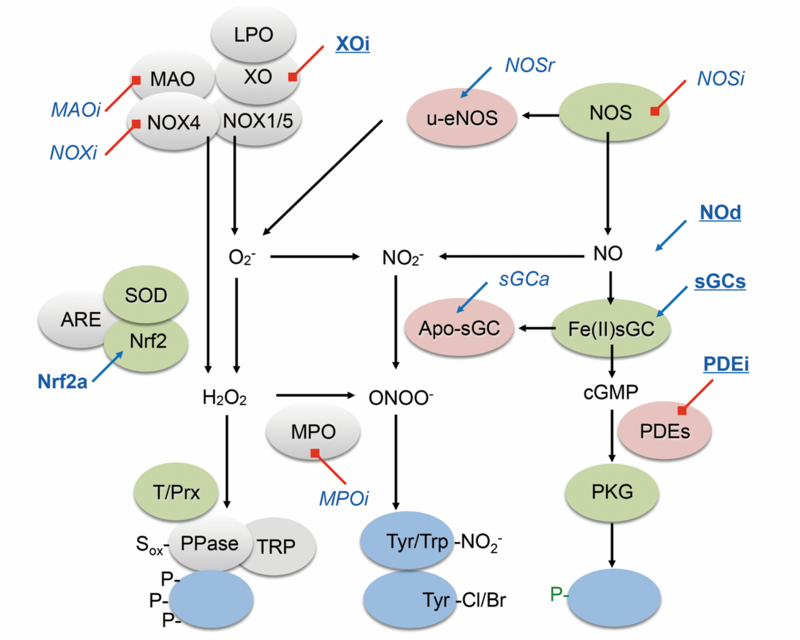 To target redox-dependent diseases safely and effectively, physiological ROS sources that are relevant for signaling need to remain untouched, whilst disease-triggering ROS should be effectively reduced. Instead of antioxidants, a more recent and innovative approach uses pharmacological agents that selectively suppress the activity of ROS-forming or toxifying enzymes whose activity or expression is increased under pathological conditions. These include the ROS generators, such as nitric oxide synthase (NOS), monoamine oxidase (MAO), xanthine oxidase (XO) and NADPH oxidase (NOX), or the ROS toxifier, myeloperoxidase (MPO), xanthine oxidase (XO). All these therapeutic targets have been recently validated both using transgenic animals or pharmacological modulators i.e. NOS inhibitors (NOSi), NOX inhibitors (NOXi), sGC activators/stimulators (sGCa or sGCs), Nfr2 activators (Nfr2a), MPO inhibitors (MPOi), PDE inhibitors (PDEi), NO donors (NOd) and xanthine oxidase inhibitors (XOi).